After twenty-four years as principal trombone with the Grand Rapids Symphony – a job she attained at the age of 19 – Ava Ordman moved to the Detroit area to work as a psychologist and continue as a freelance trombonist. While working in Grand Rapids at age 41, Ordman returned to school to pursue a degree in Counseling Psychology. Armed with her new MA, LLP, she began work at the Guidance Center in Southgate while also working as a substitute trombonist with the Detroit Symphony and Michigan Opera Theater orchestras and teaching low brass at Oakland University. Ordman had taught at several colleges and universities in the Grand Rapids area while in the orchestra, but it had never been in her mindset to pursue a full-time position at the university level. That changed when the professorship in trombone opened at Michigan State University in 2002. Ordman decided to “go for it” with the possibility of once again making another career shift. Chosen as the Professor of Trombone at Michigan State University later that year, it didn’t take long for Ordman to know that this was where she was supposed to be. In addition to her professorial duties, Ordman continues to pursue and enjoy a varied life as a performer. She is principal trombone of both the Lansing Symphony and the Cabrillo Festival of Contemporary Music Orchestra. She also performs regularly with the Beaumont Brass, which is the faculty brass quintet at Michigan State University, and the Monarch Brass, which is the flagship brass ensemble of the International Women’s Brass Conference. Yet perhaps what Ordman enjoys most is performing as a soloist. She has been a featured soloist with many orchestras throughout the United States, including her solo debut at Carnegie Hall with the American Symphony performing Donald Erb’s Concerto for Trombone and Orchestra. Ordman has been a featured artist at several International Trombone Festivals; the International Brassfest in Bloomington, IN; the American Trombone Workshop in Fort Myer, VA; and many International Women’s Brass Conferences held throughout the United States. Ordman also performed the world premieres of Steven Smith’s Concerto for Trombone and Orchestra with the Eugene Symphony and Libby Larsen’s Mary Cassatt for Mezzo-Soprano, Trombone, and Orchestra with the Grand Rapids Symphony. Both of these works were written for Ordman and, along with Donald Erb’s Concerto, have been performed by her throughout the United States. Ordman’s most recent venture, however, has been to form a consortium of trombonists and conductors to commission a new trombone concerto by David Biedenbender. This work “Their Eyes are Fireflies,” received its world premiere on March 22, 2018 with the Michigan State University Wind Ensemble and will be performed again by Ordman in the 2018-19 season with the Lansing Symphony, Michigan Philharmonic and Grand Rapids Symphony. Another recent milestone for Ordman was the release of her first solo CD in January 2017 entitled, It’s About Time: Music for Trombone by Women Composers” on the Blue Griffin label. She is also the featured trombone soloist on a Koss Classics’ CD of concertos by Donald Erb and on the CD entitled Simple Gifts, the Music of Frank Ticheli. 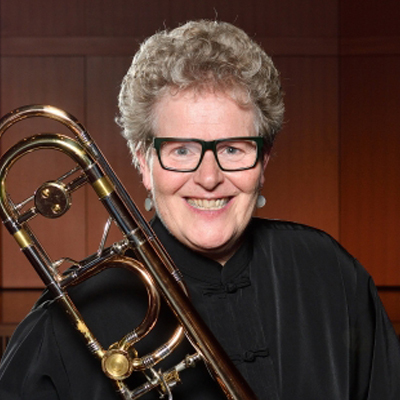 Ordman earned her Bachelor and Master degrees in Trombone Performance from the University of Michigan in 1975 and her Master of Arts in Counseling Psychology at Western Michigan University in 1998. Her primary teachers were Mark McDunn, Frank Crisafuli, Glenn P. Smith, Glenn Dodson and Arnold Jacobs. Ordman is a Bach Performing Artist.